I actually do reviews of single issues in my collection that are worth a little more or are considered more "collectable" and wouldn't really be called "Longbox Junk" for another site and figured that since I'm a sharing kind of guy, I'd bring a few of them here. The main difference between these reviews and Longbox Junk reviews (beyond the value of the comics) is that sometimes you can find other reviews of some of the Longbox Junk. . .with these, I can just about 99.99% guarantee that there has NEVER been a review, simply because most of the non-junk reviews are from the 1950's to the 1970's and comic book reviews weren't even a thing then. Uncharted territory, son! Let's start off with the non-junkers here at Comic Book Realm with a classic Batman Christmas story to fit the Holiday season, and I'll drop in a few more later. . .ENJOY! Merry Christmas one and all! And what better way to celebrate than to take a trip back in time to 1970 with the Dark Knight Detective? Okay. . .I'm sure there MIGHT be better ways to celebrate Christmas, but as far as holiday-themed comic book stories go, I'm pretty sure this one is generally considered to be up in the top ten. So grab a mug of hot chocolate, plug in the Christmas tree lights, and let's do this! WAIT! Hold on JUST a moment! I said this was a CHRISTMAS story. . .what's with the decidedly un-Christmas-y cover here? Well. . .as it turns out, this is sort of a stealth Christmas tale. You'd never know it from the cover because, unlike today's "12 issues to tell a single story", there's three stories in this issue. The Christmas story is the second story. So let's not leave the first story out in the cold and take a look. . .
Bruce Wayne goes to the state capital to try and get government funding for a social services program he's come up with. While there, he meets a senator who wants to combine an anti-crime bill with Wayne's social services program and so Bruce Wayne and the Senator fly to Washington together to work out the details. The plane is hijacked midway by thugs working for an organized crime syndicate wanting to delay the Senator's arrival in Washington so that he will miss a crucial vote and his anti-crime bill won't pass. 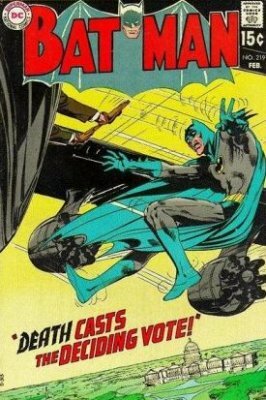 Through a series of misdirections and tricks, Batman AND Bruce Wayne take down the hijackers and the Senator arrives in Washington unharmed and able to pass the anti-crime bill. This is really more of a Bruce Wayne story than a Batman story, as the number of witnesses on the plane limit Bruce's ability to gear up. I found the story to be interesting, but ultimately forgettable. It was nice to see a more Bruce Wayne-focused story, but it just seemed that the writers felt they HAD to force Batman in there somehow, and really it weakened the story. I'm not saying the story was BAD, it just wasn't really as good as it COULD have been if it would have focused more on Bruce Wayne taking down the hijackers while preserving his secret identity. The art on this story was really very nicely done, except that the artist couldn't really draw the airplane itself very well and some of the action scenes were not that great. The coloring was also pretty sloppy in places. On the other hand, faces were very well done, with even random thugs having their own individual appearance. Overall, this was a decent little story with good art. The coloring could have been better and the story could have been better by focusing on Bruce Wayne solving a situation without Batman, but the good outweighs the bad here. And now on to the Holiday portion of our trip back to 1970. . . It's Christmas night in Gotham City and Batman is summoned to GCPD headquarters by the Bat-Signal, only to find out that there's no emergency. Instead, Commissioner Gordon tells Batman that even HE deserves the night off on Christmas and invites the Caped Crusader to sing some Christmas carols with the department. Batman is skeptical, but decides to play along until something comes up. As Batman sings with the police officers, scenes of crimes ALMOST happening, but stopping for one reason or another are shown, until the sun rises and Batman realizes that for once he wasn't needed for the entire night. This is definitely a great comic book Christmas story! There's a bit of a strange moment where Batman sees. . .or THINKS he sees. . .a ghostly spirit and it doesn't really make much sense, but other than that, the story here is nice and tight. It's not very long at all and actually, most of the story is told through visuals. . .silent vignettes of crimes almost happening with the lyrics of Christmas carols Batman is singing as the background, so the art does most of the heavy lifting. . .and does a fine job of it. This is a very nicely illustrated little story. If you can get past the modern grim-n-gritty portrayal of Batman enough to think that him singing "Silent Night" with a bunch of cops isn't silly, then this story will definitely hit the holiday sweet spot. I can see why this is considered a bit of a classic. For some strange reason, they decided to throw in a weird little sci-fi story reprinted from 1953 without Batman into Batman. . .don't know what the hell that's all about, but it's there, so let's take a look. A scientist travels into the future to assassinate another scientist that he has had a bitter rivalry with for many years. He is successful and returns to the past to take credit for the other scientist's work, satisfied that nobody will ever suspect him for a murder that hasn't taken place yet. . .but in a strange twist of fate, it turns out that the person that he killed was. . .himself. Even though the inclusion of this story was a bit confusing, I have to say that I really liked the "Twilight Zone" style of it, and if I'm honest, I really liked it the most of the 3 stories in the issue! The art wasn't particularly strong, but it wasn't bad at all. This comic book was DEFINITELY a mixed bag. . .and not in a bad way. The main story focused (mostly) on Bruce Wayne instead of Batman. . . then there was a short and sweet Christmas story with Batman belting out "Jingle Bells" with the cops of the GCPD. . .and THEN a strange sci-fi time travel tale with a twist that had nothing at all to do with Batman. And really, not a bad story among the three! Overall, I don't think this issue will appeal very much to Batman readers who prefer the "Post-Miller" Grim-N-Gritty Batman, because honestly, the Batman portrayed here can be seen as a bit silly through a modern lens. But if you're just looking for a good, fun read without a lot of darkness and angst this issue definitely hits that nostalgia spot. To the fine readers of this blog, I thank you and heartily wish you a Merry Christmas, a happy and prosperous New Year, and many more to come! Atom, thanks for sharing on here! I really enjoyed getting to read more than just your Longbox Junk!